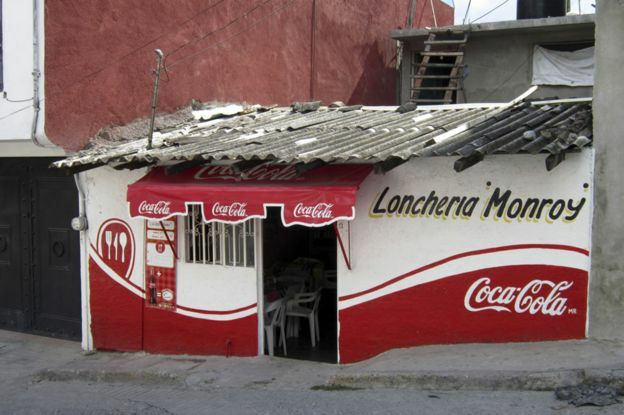 In-your-face adverts by Coca Cola plastered all around Mexico, the lack of clean water, or culture? What can we learn from this “large scale” case study in Mexico? “…All too often, the headlines coming from Mexico focus on the country’s bloody drugs war – which has claimed over 100,000 lives in the past decade. Type 2 diabetes, on the other hand, kills 70,000 per year. …So acute is the problem that two years ago, in January 2014, Mexico introduced a national tax on sugary drinks and junk food – a 10% tax on every litre of sugar-sweetened drinks and an 8% tax on high-calorie food. …The problem is aggravated by the fact that children are often short, their development sometimes hindered both physically and mentally by a diet high in junk food and low in nutrients. …Although the country’s appetite for sugary drinks has sometimes been put down to the lack of clean water in some parts of the country, Villalpando disagrees.